They're all the rage. We know you've seen the videos. Ever since Jurassic World landed in 2015, the costume sensation seen 'round the world has been the inflatable T-Rex costume. And the viral videos have made the million view mark on YouTube. But. Now it's time to add a new dinosaur to the equation. That's right! Move over Mr. Rex. We're ready for a dino with a few more horns to be the star. The Triceratops! That's right, now the Triceratops will be the whimsical dino seen traversing parks and neighborhoods and performing all kinds of hijinks. And if you're up for it, you can be in on the fun, too, with this adult inflatable triceratops costume! 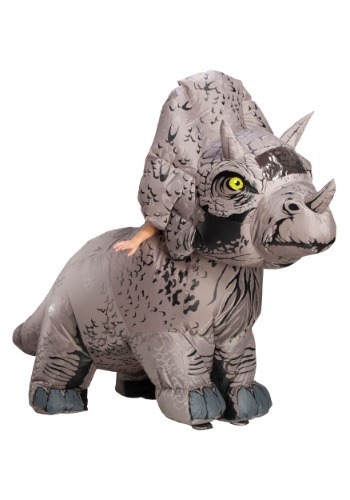 From the same company that created the famed T-Rex costume, this costume brings us another famous dinosaur, but this one comes with with four legs and three horns! This triceratops costume is big. Like huge! Constructed of windbreaker-like polyester material, it comes with 2 battery operated fans that blow up the costume to large-and-in-charge proportions. It extends behind you, to create the quadrupedal appearance, and the oversized head features a tall crest, the signature horns, and a clear window so the wearer is able to see out! We're sure you'll be the star of the scene when you go in this Jurassic World 2 triceratops costume. For your costume party, or to create a viral video that will be instantly memorable, you're guaranteed to have a blast in this inflatable costume!